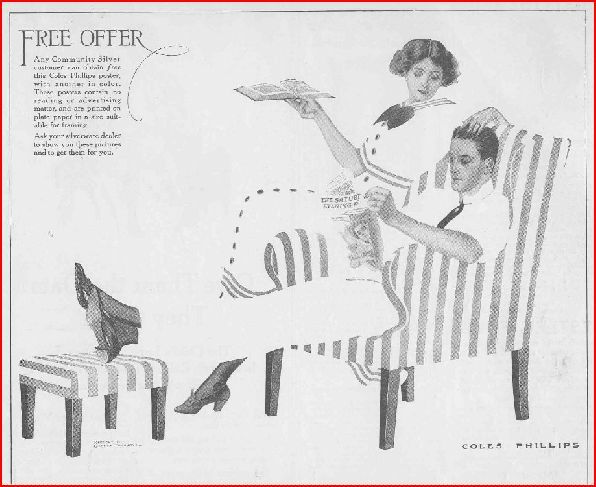 Oneida Community commissioned a series of advertisement designs by American illustrator Coles Phillips, many of which use his technique of the Fadeaway Girl. 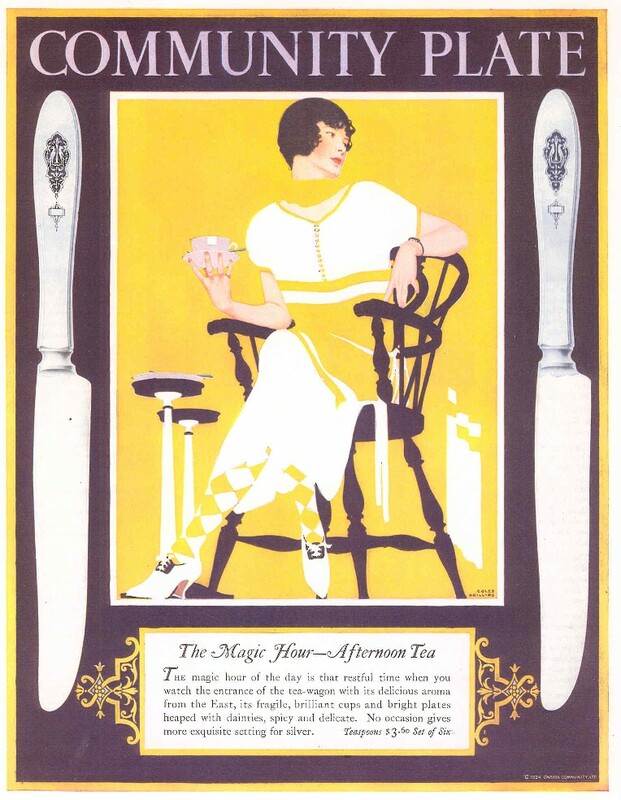 Coles Phillips incorporates this beautiful woman into an overall decorative design, with a unifying use of color. My scanner clips the edges of the large format image. 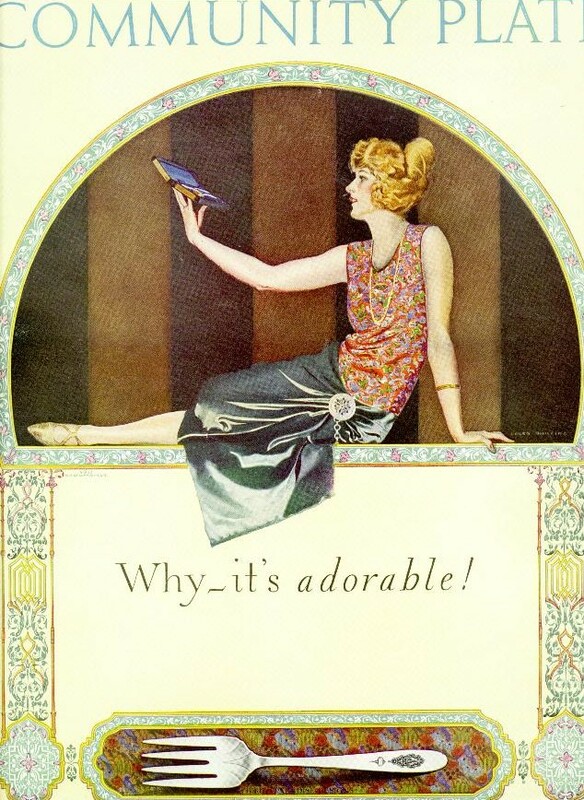 The pattern shown in this 1923 ad is Bird of Paradise. 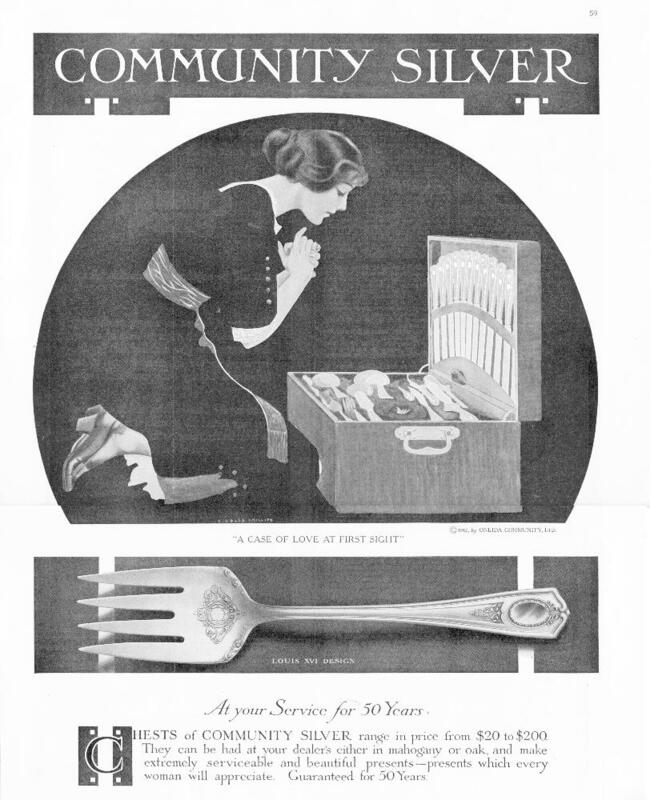 The plain surfaces of the fork are broken only by the rather oriental design of the bird, a connection which is picked up by Phillips in his overall design. The traditional elements in this illustration contrast with the women whose modernity is suggested by her hair style and slightly suggestive pose. 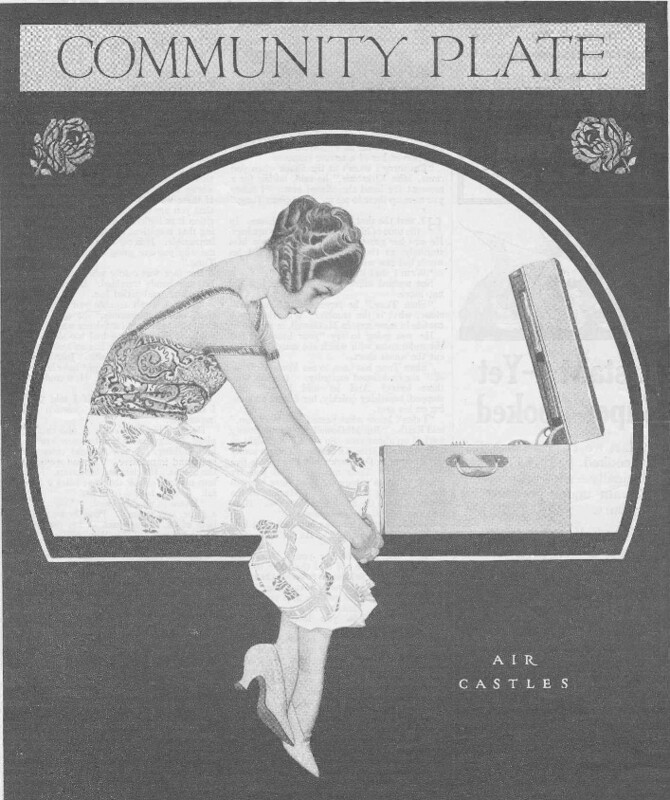 This portion of a 1911 Community ad shows an early use of Coles’ “fadeaway” technique, with the background color or pattern making up part of the foreground figure. 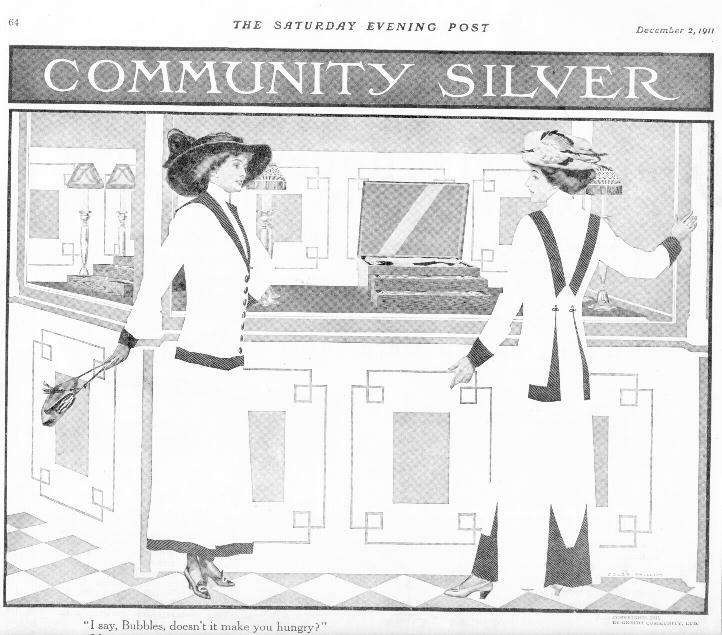 The original ad is in black and white. The following illustrations show more of the fadeaway girls in black and white. The circular frame echoes the curve of the woman’s back but the circle is not completed — it is interrupted by the fork. Here is another example of the use of a broken circle to sharpen interest in the design. But what do you see? The silver or the woman’s shapely feet and ankles? 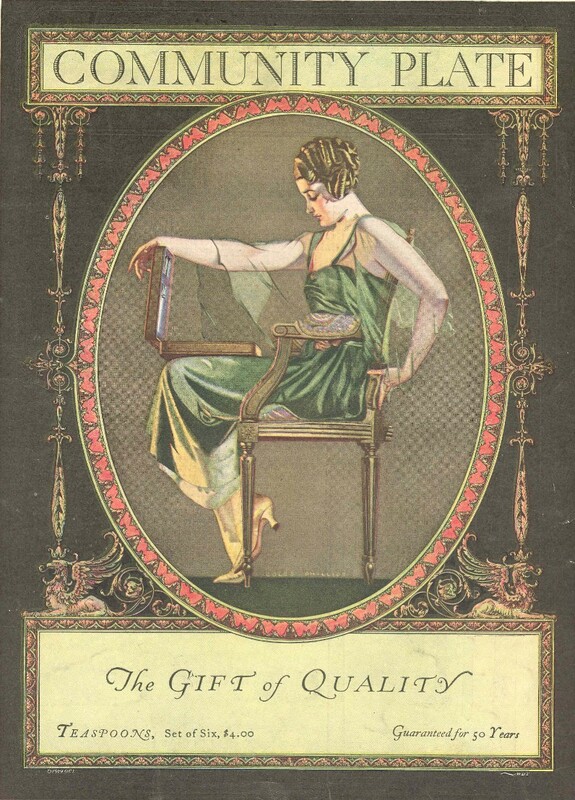 Observe the skillful use of the stripes on the furniture as part of the overall design. This is an example of the effective use of color in the Fadeaway technique. With just black, white and yellow, Phillips gives us an attractive girl combined with an effective presentation of flatware in the Bird of Paradise pattern. The traditional elements are suggested by the scrollwork, the Windsor armchair and the teacup. The modern elements are the girl’s costume, haircut and pose. Here is a site with much better quality images of Phillips’ work than mine — and in color also.